The Open Systems Interconnection or OSI model was incorporated in 1984 by ISO (International Standards Organization) to standardise network communications across different protocols and devices within seven layers of communication. The whole idea was to achieve interoperability and openness. Any computer network can be conceptually divided into seven layers. The top three layers of communication are also known as the Upper Layer, which primarily deals with data. Whereas, the bottom four layers can be grouped as Lower Level, which serves hardware functions such as data transmission, electrical signals, routing, addressing, etc. In the current days, most of the emerging technologies do not necessarily follow OSI model. However, it is still an established guide to understand any network architecture. There is a logical flow within seven layers of OSI model. Every layer must complete its designated function before the data unit is passed to the next layer. In short, there are high interlayer dependencies. Let us break down these 7 layers individually and understand it. The application layer is the topmost layer in OSI model. There are various applications available which facilitate different types of communication over a network. Typical examples are web browsers, email clients, remote file access, etc. A user typically interacts with these applications and access communication over a network. 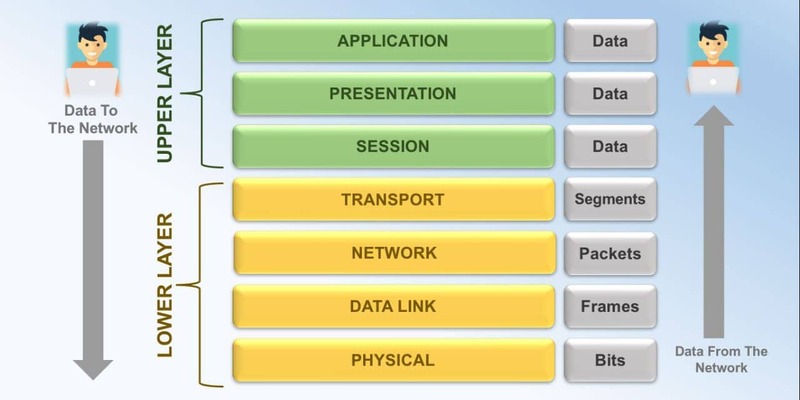 Do not get confused with these applications or programs as part of OSI model. On the contrary, the application layer provides necessary protocols or network services, such as HTTP, SMTP, FTP, IMAP, etc., to all these programs. For example, you can configure email client on your smartphone by configuring IMAP or POP settings, which are nothing but Application layer protocols. 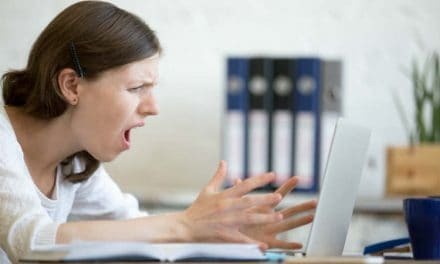 Another example is when you try to browse the internet, HTTP is the application layer protocol which identifies the communication partners, establish resources & orchestrate communication. This layer either provides or receives data from the presentation layer. The presentation layer works with the format and syntax of data to be sent or received from the application layer. This layer also handles data functions such compression, encryption, decryption, etc. Sometimes, the presentation layer is also known as syntax layer. Some of the typical examples are GZIP, ASCII, JPEG, TIFF, etc. Session layer establishes, manages and terminates the connection between different hosts or computers. Typical examples of session layer protocols are NetBIOS, Named Pipes, etc. The transport layer transports data by segmenting, multiplexing or splitting. Session layer passes the data to transport layer, which in turn convert it into smaller units and further delivers to the network layer. It can check for data errors, confirm reliable delivery and resend the data if not delivered correctly. Typical examples of transport layer protocols are TCP (Transport Control Protocol) and UDP (User Datagram Protocol protocols). The network layer is the 3rd layer of OSI model. The concept of routing comes into the picture when we talk about this layer. A network router is required when one node wants to talk to another node of a separate network. The data is pushed to this layer from data link layer in the form of frames. All these frames have source and destination addresses. The information is passed between different nodes until the data reaches its final destination. Once the data reaches its destination, this layer converts the data into packets and further pushes it to transport layer. But if the data fails to reach its destination address then network layer sends back the frame to the data link layer after updating the last destination address. The network layer provides the functionality of dividing and transferring data in the form of packets between one node to another on a different network. There could be several nodes on a network, and this layer decides the best route to be followed for getting the data delivered at the source destination. 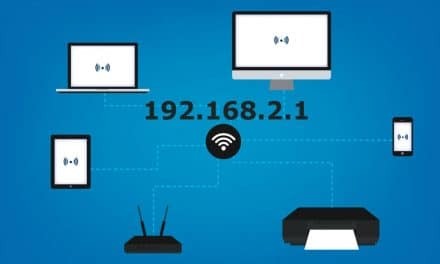 This layer also serves the task of logical addressing such as IP address among various connected devices on the network. Also, it manages the mapping of different logical addresses and physical address with the help of ARP (Address Resolution Protocol). IP (Internet Protocol) is an example of network layer protocol. Other examples are ICMP (Internet Control Message Protocol) and IGMP (Internet Group Message Protocol). Data link layer receives data from physical layer in the forms of bits, and it packages into frames. This layer also checks for any possible transmission errors in data and corrects them. The data link layer manages MAC address of different network devices on the network. A common example is the layer-2 network switches which interconnect several network equipment. Data link layer further divides into two sublayers as MAC (Medium access control) and LLC (Logical link layer). The physical layer is the lowest level of the OSI model, and it encapsulates all physical connections and types of data signals communicating with them. Typical examples of the physical medium are ethernet cables, fibre optic cables, etc. Data signal could exist in the form of the electrical pulse signal, optical signal, radio signal or infrared signal. Here data is transmitted in the form of bits. This layer also looks after the transmission and reception of raw data through the physical medium and is responsible for bit rate control. Network topologies such as bus, mesh and star exist here. Also, data transmission such as simplex, half duplex and full duplex is part of the physical layer. Cable specification, signal voltage, line impedance, pins or any characteristic of any entity in between physical medium or connected devices, belongs to the physical layer. Please note that no protocols work in this layer. PreviousHow to download free songs from Amazon.com?